Tilly's Crafts: Where did that week go? Hello all and I hope that you've had a good week? It was our half term week here and seemed to pass in a blur - it's a bit unfair how quickly it disappears lol! I left husband and son home alone (husband had work and son had 'things' planned with friends!) and headed down to Sussex to spend a few days with our daughter Lauren. It was so lovely to spend some time together - although marred a bit by the fact that my husband's incredibly kind parting gift before I left was to pass on his stinky cold! So although my daughter and I had some precious time together, much of it was also sadly spent sneezing and coughing. Now I'm back home, husband and I still seem to be full of cold - it's obviously one of those that doesn't want to be shaken off quickly - sigh. Youngest son is (wisely) giving us both a wide berth! Anyway, just wanted to share a card with you that I was able to make before I went away - using one of my favourite Sarah Kay stamps "Time for apple pie"
The papers are from LOTV, as is the sentiment stamp. I've added flowers from WOC and die cut ivy corner from Joanna Sheen. 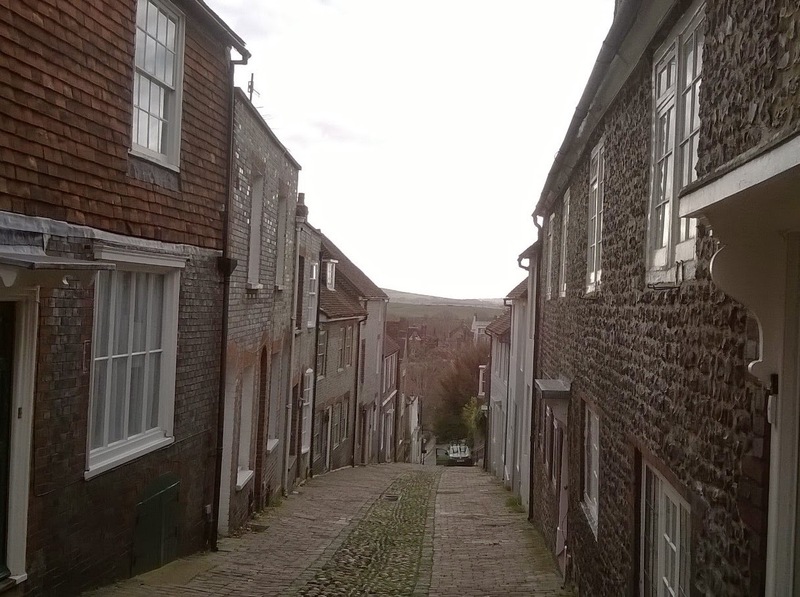 And I just thought I'd share a few pics of Lewes, the beautiful little market town in East Sussex where my daughter is now living - taken when we were out on a walk the other day (so excuse the overcast February weather!). There are lots of these little narrow, cobbled streets (called 'twittens') with such cute little houses - but they are quite steep so I can imagine they're a bit treacherous in bad weather! My daughter lives near the top of one of these - keeps you fit walking up and down the hills lol! 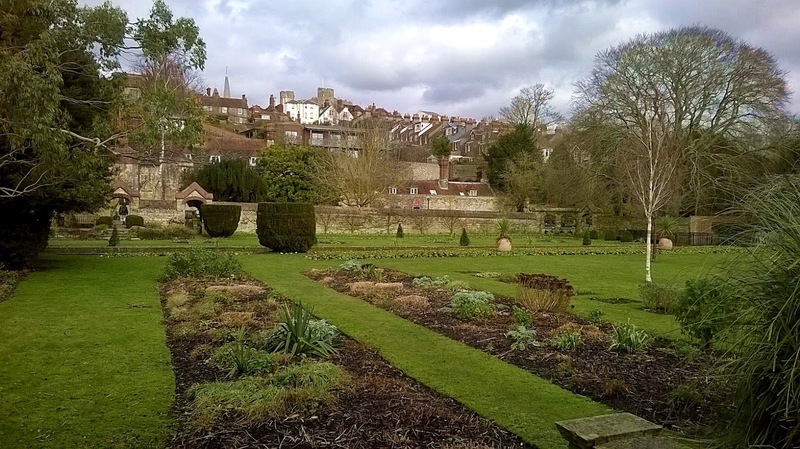 We had a walk through Southover gardens in the town - and you can see Lewes Castle on the hill in the distance in the top photo. They'll be beautiful in a few more weeks when all the spring flowers and blossoms are out! 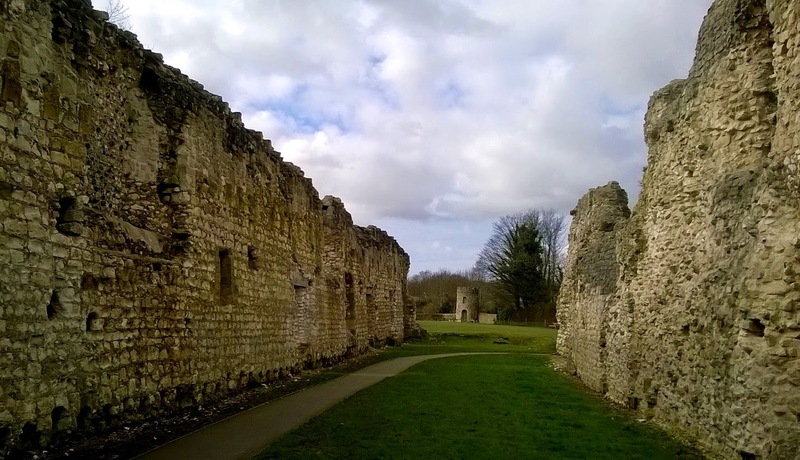 And then a walk around the Priory ruins, of the 11th Century priory of St Pancras, an active priory until the dissolution of the monasteries in the 16th Century. The ruins are open to wander around, with lots of information about how it would have looked, what the various buildings were, etc. And after all that, we treated ourselves to lunch in a sweet little cafe near the castle! Perfect girly time! 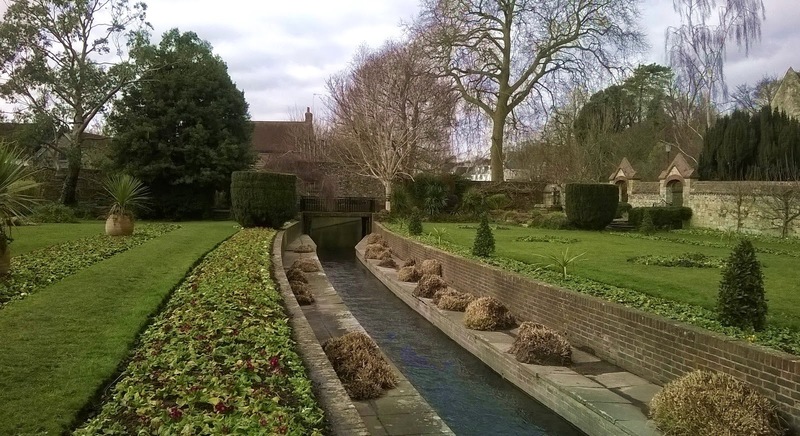 I hope you'll forgive the photo overload - just thought I'd share a few pics of a very pretty little corner of the country! Absolutely gorgeous Kim, love the sweet image so beautifully coloured. Pleased you had a lovely time with your daughter, beautiful photos. Your card is gorgeous Kim, such a sweet image and beautiful detailing. I am pleased you had a good time with your daughter despite feeling unwell. Thank you for sharing your beautiful photos. So beautiful Kim..fabulous colouring and love the papers and flowers..so very pretty. Hope you feel better soon and great photos of the quaint little houses..
GORgeous .What a sweetie she is! I LOve your papers and design Kim. It's so nice to have catch up time. Sorry your down with a cold, hope your better soon..
LOvely photo's Thanks for sharing. A gorgeous card Kim. I love the image and pretty papers. Such a sweet card, love your colours and pretty embellishments. This is gorgeous Kim. A beautifully coloured image and a beautiful design. Love the papers. Your daughter lives in the most delightful place. Beautiful - love the image and fabulous papers. So glad that you enjoyed your time with your daughter, albeit with a cold. Hope it goes away soon. Such a pretty creation Kim. So sorry you are still full of cold, glad you had a good time with your daughter even though you were coughing and sneezing. This is beautiful Kim! Love the design and gorgeous colour tones. So pleased that you had a great time away with your daughter, it looks absolutely lovely. Hope you feel better soon. Fabulous card Kim, great design, love pretty papers and perfect colouring on your sweet image! Great photos, looks a lovely place, never been there. LOVE your photos Kim. I would so love to visit Britain one day and explore such fabulous sites. Speaking of which, your card is fabulous too. The sweet Sarah Kay image is colored perfectly and I really like the spring colors. Hope you feel all better soon. Hugs!